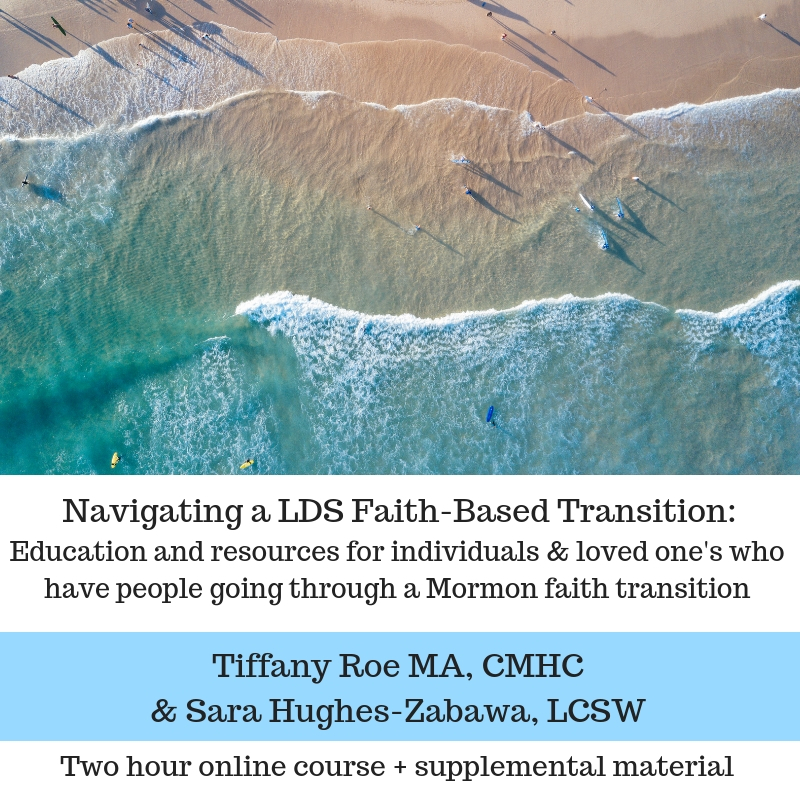 I was thrilled to join Tiffany Roe of Mindful Counseling in creating a course for individuals experiencing a LDS faith transition, as well for the loved one's who care about people going through a faith crisis or shift in religious belief. We wanted to honor both sides of the coin and acknowledge families, individuals, and loved ones all need support and guidance as they navigate this developmental experience. This video lecture follows this outline with education, resources, specific activities and skills to work on each point, examples, and guidelines to support you in your unique and specific faith discovery and relationships. - 16 page supplemental resource guide for individuals experiencing a faith-transitions AND support for family members who have a loved in a faith transition. - Specific examples and scenarios for communicating during your faith transition, including word for word examples. This is a meaningful resource for those experiencing a faith transition as well as family and friends who love someone going through a faith transition. Please consider using the affiliate link below, it allows me to receive a portion of the proceeds. Use code Blackfriday to get 20% off. I want to thank Tiffany again for this opportunity to join her. I'm thankful to share her passion in helping others thrive spiritually while supporting healthy boundaries and maintaining meaningful relationships with loved ones. Establishing healthy boundaries with friends and loved ones can be challenging. We are often scared to set boundaries for fear of offending others, disappointing others, or challenging the level of connection we feel in those relationships through saying "no". However, NOT setting healthy boundaries that honor one's limits can lead to resentment, burn-out, avoidance, emotional fatigue, and strained relationships which in turn hurt the relationships we were trying originally to protect. Boundaries actually allow healthy relationships to thrive and invite both parties to show up as their best selves owning and honoring their individual needs and limitations. When setting healthy boundaries with friends and loved ones that you would like to preserve, maintain and strengthen a connection with, consider the following 3 simple steps. As we consider these 3 steps and their corresponding examples, we are going to assume that you are being asked to do something that you are either not comfortable with, you do not have the emotional reserves for, isn't the right choice for you to participate in, or you are simply choosing to say no. 1. Express Gratitude: Prior to setting a firm and clear boundary, it can be supportive to express honest and sincere gratitude towards the person you will be setting a boundary with. This step fosters acknowledgment, connection, and appreciation. Sample Scenario: Someone asks you to participate in an event that you simply do not have the emotional time or energy to participate in. "I really want to thank you for thinking of me as someone who might want to participate." "I appreciate the invitation, it makes me feel included and thought of." "Thank you for reaching out and considering me to participate." "I'm flattered that you would consider me to participate." It's important that if you express gratitude that it is honest and sincere so that it will ideally be received as genuine. 2. Establish Clear Boundary: Boundaries at their core are a simple declaration of what you are or are not comfortable with or able to do. When establishing a boundary clearly own your truth, your limitation, or your comfort level without giving into the temptation to apologize, make an excuse, justify your boundary, or overly explain your situation. We often share more information than we need to with individuals who haven't earned a right to that level of vulnerability in hopes to justify our limits. I'm going to invite you to be simple, kind, and firm in your approach to stating boundaries and challenge the need to overshare and/or over justify. You can also express what you are able to do in relation to what's being asked to see if that is an option. This allows you to set a boundary that honors your limits while offering an alternative that works for you. Sample Scenario: Someone you love asks you to attend an event that isn't the right choice for your emotional, mental, or spiritual health. "Attending isn't the right choice for me"
"I'm not comfortable with attending"
"Coming isn't the right choice for my mental health right now"
"I am not able to participate at this time"
"Attending doesn't work for me"
"I'm not able to come to the event but would love to meet up afterward"
If individuals press you for more information or wonder "why? ", you can simply repeat the boundary in another way or consider what level of information feels right for you to share, that might sound like: "that's personal" or "That's all I'm comfortable sharing at this time" or "That's private." If you would like an opportunity to discuss in more detail the reasons for your boundary you could suggest a conversation at a time and place that works well for you that sets you up for the greatest amount of success in that conversation. That could sound like: "I'd be happy to talk more in person about my inability to participate. Let's find a time this week during the day to connect in-person and talk." 3. Establish Importance of Relationship: To secure and reinforce that the relationship between your friends and loved ones are important to you, and not challenged by the boundary created, consider finishing a boundary statement by creating an opportunity for reconnection and/or a reminder of the significance of the relationship. Sample Scenario: A family member wants you to get involved in a family situation that you're simply not comfortable talking about or getting involved in due to past family drama. Sample Responses: "I'm so glad you know you can talk to me about anything. (gratitude). I'm not comfortable talking about this specific situation, I'm trying really hard not to get involved to protect my own wellness (boundary). I would, however, love to get together for tea next Tuesday and talk about how your recent trip to Hawaii went, I love our talks about travel - they always leave me uplifted and excited (fostering connection)." "I will miss the opportunity to connect with you on (date of event or experience you won't be participating in). Could we schedule a time to get together soon? I would really love to get caught up." "I love you, thanks again for reaching out and thinking of me, it makes me feel loved and seen." "I am so lucky to have you in my life, thank you for considering me, will you ask me again at a later date to participate, I might be able to then?" "Our friendship means a great deal to me, thank you for reaching out, please know I'm here for you too." "Thank you for honoring where I'm at, I love you and appreciate our friendship." "Thanks for thinking of me, I'll call this week to get caught up." "While I'm not comfortable with (name what was asked of you), I am able to do (name what you are capable or comfortable doing), and I'd like to support and honor the significance of our relationship." For additional examples, here are some sample scenarios and responses with all three steps shown. Remeber when you're creating your own boundaries use words and phrases that feel honest and authentic to you. Sample Scenario: You are asked to particpate in an experience or trip with friends you can't afford without causing financial strain and stress. Sample Response: Thank you for the invite, it makes me feel loved and included. I'm not able to afford to come this time. * Let's get toether when you get back and grab a quick lunch (reinforce relationship). *Notice how the person didn't applogize for not being able to afford the experience or share an excuse why they can't afford it - simple and clear with no need to apologize. Sample Scenario: You're asked to particpate in a fundraiser you would love to support the cause and person but doing so will truly limit your ability to be there for other obligations that need your time and attention at the moment. Sample Response: I am so glad you thought of me. I really support your work and believe in the cause. Right now participating is not the right choice for me. However, would you be willing to reach out again in a month or two if you are still in need? I might be in a different position then. Know I love and support you and am flattered you thought of me! Sample Scenario: You are asked to attend a religous family event that is not the right choice for you to attend. but would be able to meet up afterwards. I would love to show my support of your family in ways that honor my ability to. Let me know if that works well for you. Once again, thanks for thinking for inviting me, it makes me feel loved and included! I want to acknowledge that while these three steps are simple, re-establishing healthy boundaries with loved ones that were previously unhealthy or lacked boundaries can be anything but simple, and often individuals experience a great deal of pushback once they begin establishing healthier boundaries, especailly with loved ones. As you practice these three steps notice what response you get back from those you are setting boundaries with. Give yourself permission to take ownership in the boundary creation and maintaining boundaries while allowing others the responsiblity to show up and honor those boundaries. It takes two willing participants to have boundaries created and respected. 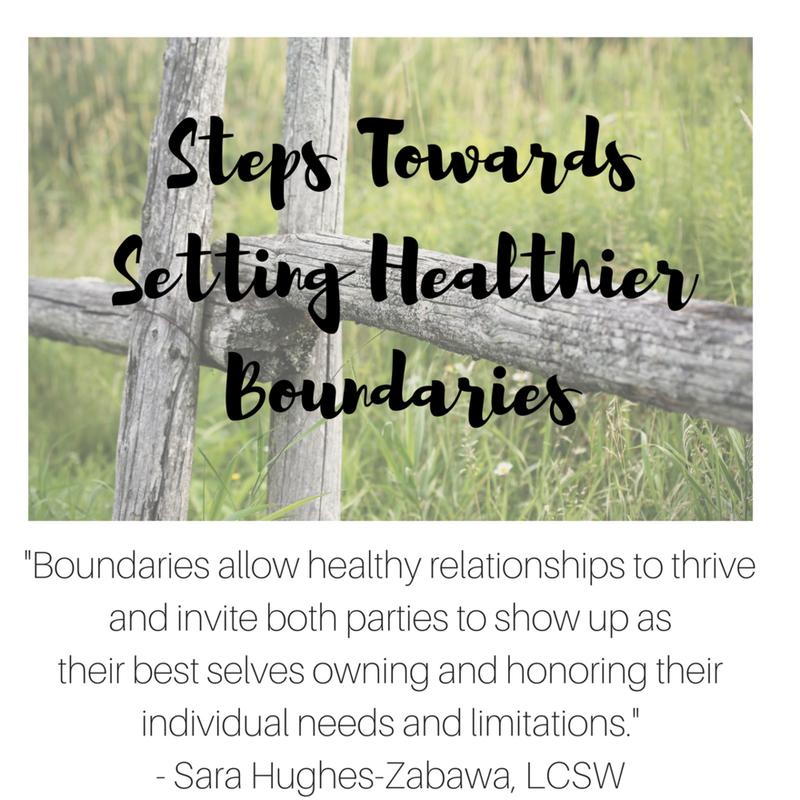 Feel free to comment and let me know how I can support you in creating and maintaining healthy boundaries with friends and loved ones. I am professionally dedicated to helping others create and foster healthy boundaries for themselves, their families, and within the organizations that influence their lives. I am passionate about exploring how religious institutions can be healthier and safer places for its members. In the following article, I discuss how challenging the past week has been for individuals connected to the Mormon faith who have experienced previous sexual abuse and systemic injustice and have also felt unheard and ignored in their search for help, justice, and healing. I believe as we know better we are obligated to do better and I will continue to champion the voices of abuse survivors and respect the wisdom they have to offer. It is through their lived experience that we can learn and adopt healthier practices that will ideally reduce the risks of future abuse. Are you in a season of your life that feels stormy? Maybe you are caring for an elderly parent, battling depression, ending your marriage, or experiencing a loss of health, faith, or financial security. Regardless of what it is, life shifts can cause suffering, various levels of discomfort, and a general sense of chaos. The following ideas will support you create a sense of calm within the chaos. Return to Your Breath – Place one hand on your heart and one hand on your belly. Take a deep inhale and exhale... in through the nose and out through your nose... feel your chest and belly rise gently underneath your hands as your breathe. Repeat the practice until your thoughts soften, your jaw unclenches, and your mind gently slips back into the present moment. When we are experiencing emotional or physical pain our thoughts are often busy digging around in the past or trying to frantically organize the future. When we return to our breath we invite our mind back to the only moment we truly have power and control over – the here and now. The sympathetic nervous system is calmed that allows our fight-or-flight response to soften. Returning to our breath and to the present moment is one of the quickest ways to both honor and reduce our suffering. Create Stillness – Sometimes the last thing we want to do is sit with our suffering. We tend to be afraid of letting ourselves feel pain. So, we opt for numbing behavior that provides an immediate distraction. What behaviors do you gravitate towards when you want to numb? Do you start scrolling through social media, or pressing “next episode” over and over again, working longer hours, or creating a busy schedule to try and outrun the discomfort? Do you feed the chaos instead of quietly sitting in it? In her book The Gifts of Imperfections: Let Go of Who You Think You’re Supposed to Be and Embrace Who You Are, Brené Brown states: “We cannot selectively numb emotions. When we numb the painful emotions, we also numb the positive emotions.” Therefore, we can not numb pain without also numbing hope, joy, and peace. Creating stillness in our lives provides us the opportunity to connect internally, acknowledge our suffering, and invite healing to occur. How can you foster more stillness in your life to challenge the chaos? Consider the ways you like to be still and ask if it is realistic to set aside 1-15 minutes a day to simply breathe and check back in with your mind and body. Could you adopt a mindfulness practice such as meditation? Would utilizing a meditation app on your phone help you begin to foster stillness? What is one thing you could add or subtract in your daily routine that would cultivate more stillness? One tip is to combine the practice of stillness with something you already do. For example, I have added a few deeps breaths and a minute of reflection before checking my emails, something I do habitually throughout the day. Creating stillness is one of the healthiest ways to challenge the chaos you may be experiencing internally and externally. If you are finding it hard to reach out and foster connection, dig deep and explore what is holding you back – is it fear? One of the barriers we can face when fostering connection is we don’t feel ready to share the details of our trails or challenges with others, even with those close to us. To address this, we can set boundaries surrounding what we are willing to share, while still accepting support and connection. For example, would a loved one understand if you said “I’m not ready to share what I’m up against right now, but I could really use some quality time together” or “I’m struggling and not ready to talk about the details, but I would benefit from your love and support right now. I could really use a weekly phone call…”. Often times when we need support we need to let our support team know how we feel cared for and comforted – after all, they can’t read our minds. As you reach out to others to foster connection in the chaos can you make an effort to specify what type of help and support you are looking for? As humans, we are hardwired for connection and it is needed and important in seasons of distress. Connection with others has proven to reduce our physical and emotional suffering while prolonged loneliness can have catastrophic long-term health consequences. So, consider setting a connection goal daily and/or weekly in times of stress to help foster the additional support you may need. As you foster and create calm in the chaos, set aside time to nurture a connection with others. I'd love to hear from you. What are some other ways you can think of that this might become a regular possibility in your life? What are some of the things holding you back? What has worked for you in connecting with others in times of stress that others reading this might find useful? Are your difficult conversations stuck on repeat? Do you feel like you are getting nowhere with your loved ones and friends? If so, consider changing up the questions you keep asking. I often have the privilege of working with clients who are experiencing a faith crisis or faith transition. I also work closely with families, parents, and couples who have had a family member, child, or spouse make the decision to transition from a previously held faith tradition. I consider this work to be some of the most tender and meaningful work I do because when there is a willingness to choose love, practice respect, and surrender one’s ego (meaning letting go of what you want for someone and honoring their choices as truly only theirs to make) there is an opportunity for relationships to not only be saved but strengthened. The most commonly asked question of someone who leaves a faith tradition is “why?” It seems like a simple enough question - but it is anything but simple. The reasons it is asked and how it is answered can be as complicated and unique as those both asking and answering the question. Usually, these conversations go nowhere, people become naturally defensive, feelings are hurt, and relationships are strained. Explaining to a believer why someone no longer believes is a delicate dance and vice-versa. The times I have seen it be done successfully is when the person asking the question is truly ready to LISTEN, while following up with love and respect for the differences expressed. Most of us haven’t practiced that level of maturity, especially when discussing what we hold as sacred. So, if our goal is to love others and save and strengthen relationships can we try to change the questions we are asking? How can I support you in spiritually thriving, even though that might look different than before? Honoring our differences, what can I do to show you I love and support you? What is important for me to know about your faith journey/experience so I can demonstrate more empathy? What verbal reassurance or behaviors do you need from me to know our friendship isn’t contingent on your religious affiliation? What more can I be doing to show my love and respect for you? Can you see how these questions have the ability to change the outcome of a conversation while strengthening connection? So ask yourself, what conversations am I continuously struggling with and how can I reframe the questions for a different outcome? If I've said it once, I've said it a thousand times. Anxiety lies! Anxiety is a lying liar who lies! I'd yell it from the rooftop if I could. Anxiety is a master manipulator and it exaggerates the truth until it is blue in the face. Anxiety has a tendency highlight our biggest fears and weaknesses without taking into account our strengths, capabilities, or our lived experiences of continually doing hard things. Anxiety shoves reality out the window and sets up camp in our mind and body while it begins preaching doom and gloom to our soul. Anxiety will remind us of the worst case scenarios but will never mention all the times it has been dead wrong. It always skips over all the lies it told us that never came true. While anxiety tends to be a hindrance to us currently, historically and genetically, our anxiety served an important purpose for our ancestors, it was an evolutionary adaptation (EEA) to avoid danger and harm. In potentially dangerous situations, the physical and emotional sensations of anxiety caused our ancestors to respond by fighting (escalating behavior) or fleeing (de-escalating behavior) to respond to dangerous situations. Today our brains remain programmed to reduce harm and experience an increased sense of safety. While our brains' responses have remained relatively the same, what we now interpret as dangerous and anxiety provoking has morphed and changed with time. For individuals experiencing anxiety, the sensation related to having to make a phone call, showing up at a holiday party, braving winter roads, or having a hard conversation with a family member can produce the same physiological responses as staring down a sabertooth tiger. This is why anxiety is a tricky, tricky, lying, liar because the stimulus that causes us to experience such physical and emotional discomfort usually isn't as dangerous as our anxiety tell us it is. For example, for someone who has anxiety, making a phone call may feel as scary as staring down a sabertooth tiger but in actuality, their lives are NOT at risk. Very rarely are people harmed in the making of a restaurant reservation, and yet it can feel terrifying to do so. What are the physical signs and symptoms that I'm experiencing anxiety? Where do I feel it in my body? Example: Racing heartbeat, sweaty palms, pressure on the chest, blotchy skin on neck and chest. Right now, my anxiety feels like it is living in my stomach. What thought patterns do you I often experience that create or increase my anxiety? Example: "I'm not good enough", "No one will talk to me." "I always mess up", "Everyone notices my flaws", "Everyone thinking I'm weird", and "I can't do anything right", "Nothing ever works out", or "I shouldn't even try, it won't be perfect enough". What are the people, situations, or environments that triggers me to experience anxiety? Example: Social situations, taking a test, talking about money, asking for help, when I'm really tired when I have low blood sugar, or after a major disappointment, or when I'm feeling really incompetent and/or vulnerable. Second, we need to practice being brave! While awareness is an important first step, it often isn't enough to quiet the lies anxiety tell us. To tackle anxiety, especially social anxiety, we need to expose ourselves to what we're most afraid of to prove that our anxiety is being dishonest and that it is actively distorting reality. This is only appropriate when what we are anxious about doesn't pose an actual risk to our mind, bodies, or spirit. If you have anxiety about going into dark alleys in the middle of the night, that anxiety seems to be warning you of appropriate an realistic possible harm - let's listen to it. In therapy, we utilize exposure therapy as a way of being brave, challenging anxiety, and showing it who is boss. This means we expose or experience the situations that usually cause us anxiety, armed with the improved coping mechanism, and then follow up the experience with a strong dose of reflection to compare what anxiety told us would happen and what ACTUALLY happened. What did the experience feel like in my body? Was the story my anxiety told me about the situation, (holiday party, taking a test, making a phone call) match up with the experience I actually had? What was "real" about what just happened? Reflect on the experience you just had - what actually happened? Did my anxiety lie to me? If so, how can I recognize and challenge my anxiety in the future so I can tell it to shut up? Do the lies my anxiety tell me have a regular pattern? Example: Yes, my anxiety continually exaggerates how uncomfortable a situation might be, when the reality is that most of the time, it's okay, or at the very worst, tolerable. Example: My anxiety is telling me that no one will like me, so I shouldn't even try to make friends. Example: My biggest fear is that if I'm myself when I meet new people, no one will like me. Example: Well actually, when I'm being myself I do find that people like me and I'm able to make friends. I'm a kind and loyal friend. It's when I listen to my anxiety that I end up acting off, I resort to being really quiet and distant, and not giving others the opportunity to get to know me. My anxiety does have some truth to it, not everyone is going to like me, but at the same time, not everyone is going to NOT like me. You win some, you lose some. 4. Practice Being BRAVE! As long as the anxiety-producing situation doesn't pose an actual threat to your mind, body, and spirit - practice stepping into the situations that cause you anxiety, with the help and reassurance of anxiety management coping skills (deep breathing, having a plan, writing a script, utilizing a support person or wing-man, etc). This means you show up at the holiday party, try a new hobby, have the hard conversation, and make the phone call. You practice doing exactly what you're anxiety is telling you not to do. When we face what feels like our personal sabertooth tigers, with our coping mechanisms in hand, we prove to our mind and body that the reality of what we are most scared of is actually not a life or death threat. Instead, our sabertooth tiger is a customer service representative named 'Dan' who was really nice and more than willing to talk us through a payment plan for our medical bills. 5. Remember to Reflect - this step is often missed but it is VERY important if our goal is to really shut-up anxiety longterm. AFTER being brave and surviving an anxiety-producing event, taking the time to remember the messages and lies your anxiety told you and comparing it to what actually happened is important because you begin to identify and shut down anxiety patterns. You start to expose your anxiety as a fraud and the lying liar that it is As a result, you start to believe your anxiety less. For example, say your anxiety always lies and says you'll never enjoy yourself in social situations because you always say dumb things, so to reduce feeling anxiety and discomfort you opt to stay in most nights. However, you're brave and go out with friends and have an enjoyable experience, you say a few dumb things but so does everyone else! You come home and before you forget the lies your anxiety told you, you reflect that your anxiety often is super critical of how YOU will act but it's very gracious and forgiving towards how others act. You begin to notice a pattern that your anxiety tends to exaggerate your actions and how you will be perceived by others. You notice a pattern that your anxiety always lies about how others will view you but in reality, those same friends you think you act stupid in front of, who are embarrassed by you, keep asking you to spend time with them! Stepping away and exploring our experiences right AFTER an anxiety-producing experience can teach us a great deal. So, the next time you are brave and show up to face your anxiety and experience the relief of passing the test or having the hard conversation you've been dreading, take a few minutes and reflect and put your anxiety in its place! I want to take a minute to acknowledge that some people experience "free-floating" anxiety or Generalized Anxiety Disorder where an aspect of their anxiety is not always rooted in facing specific situations. While the steps above remain an important foundation for challenging anxiety-producing thoughts and experiences, sometimes a gentle surrender is often required for free-floating anxiety where the anxiety is simply noticed, the person acknowledges they can't identify its source, and they practice sitting with their anxiety without feeling the need to solve it or act on it. Instead, they remind themselves their anxiety will pass or lesson with time while utilizing appropriate coping mechanisms like mindfulness or deep breathing. In the near future, I'll write a blog post on how we can learn to mindfully sit with our free-floating anxiety. I hope these simple tips and tricks help you have a more honest relationship with yourself, your anxiety, and that you begin to challenge the lies anxiety often tell you! Just like everything else, it takes practice, self-compassion, a bit of failure, and a willingness to try again. Feel free to leave any comments or questions in the comments section below! Hold on to your hats - weekly blog posts are coming soon!